The other week I received a rather curious comment from my husband. He said he wanted to learn to make pork belly. “You aren’t ready.” I told him. I thought that a good pork belly, the one with really crispy crackling combined with melt in your mouth meat and a rich gravy was something only experienced cooks attempted. But he insisted to make it for dinner and I said, knowing the failure to come, that I would have nothing to do with making the dish. So off he went to buy the pork belly and every so often I’d get a text asking for advice. “What knife to use to score the pork belly? Knife not sharp enough? ?” or “Where is the thyme in the garden?” and “How do I turn on the oven?”. The questions were getting scarier and scarier and so I chose to ignore the messages and decided to go with plan B, and buy take away. I knew I had made the right decision when I got home a few hours later. The kitchen counter was as clean as I had left it that morning and I thought that He must have aborted the project mid-way. I was impressed though that he had cleaned up. Come dinner time however, he pulled this big slab of pork belly from the refrigerator and started portioning the meat into generous servings, ready to crisp the pork skin in the oven. “Uhm, where’d you get that?” I asked him. Surely he didn’t make it. Did he? Turns out, you can pretty much learn how to cook anything from You Tube. He had found a video of Gordon Ramsay making a twice cooked pressed belly of pork and proceeded to make his own. What can I say – I was humbled. It was exceptional. He even made a gravy and cauliflower and apple mash to go with it! I learned a lot of things from my husband that day. First, when someone says you can’t do something, challenge it. Second, never underestimate a person’s abilities and third and most important lesson – my husband makes a mean pressed belly of pork! Season the pork belly generously with salt, pepper and olive oil. Place the garlic in a roasting pan and the thyme on top of the garlic. Place the pork belly on top of the thyme. Cook the pork belly for 2 hours. When done, remove and set aside to rest. Place the pork on a tray and place another tray on top of the pork belly. Press down on the top tray and place some weights (i.e. some cans from your pantry) on top of the tray to weigh it down. Refrigerate for at least 6 hours. When the pork is ready, pre-heat the oven to 240c (fan forced). Slice the belly of pork into 4 to 6 portions of smaller squares and cook for around 15 minutes until the skin crisps. While the pork is cooking, heat the gravy. 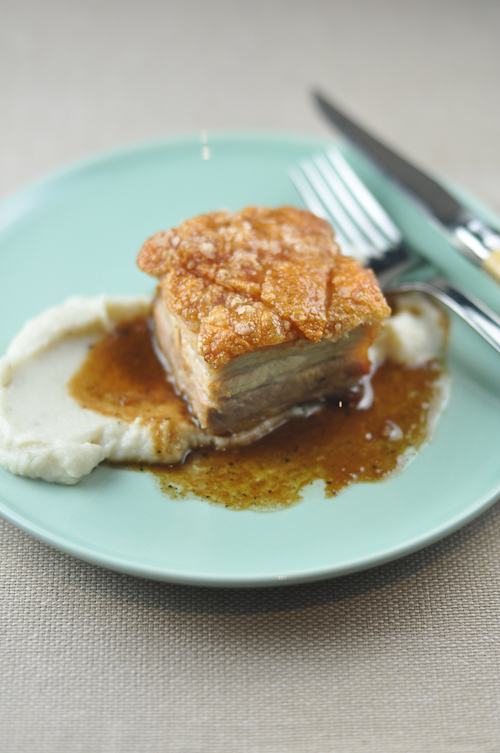 To serve, place the pork on a bed of cauliflower-apple mash and pour the gravy around the pork. Ok, you got me… i don’t even know how I got to your blog, but I will be coming back. Love your writing, love your food ideas. Awesome post! thank you! I will definitely be making this… finding pork belly isn’t easy though, I find it at wholefoods sometimes… i repeat… sometimes! anyways, thanks! Oh, and fantastic job to the husband! Thank you for this. It was great but my cracklings didn’t crackle. Have to try again. Your husband beats me hands down. You wrote that need “enough so that it covers the roasting pan during the cooking process plus a little more to deglaze the pan when done” but in the recipe I am missing the instructions to put white wine in the roast pan. Sounds lovely and I’m impressed by your husband as well! (I would have despaired too after the “how do I turn on the oven” question). One question: in the ingredients you mention enough wine to cover for roasting, but in the instructions wine is only used for deglazing? Oh I love this story! I bet he was super smug (or not, if he’s a nicer person than I would be!). I’ve learnt a hell of a lot from youtube – somewhere between the odd videos of crying teenage girls, it’s a very good resource! This is heaven in a plate. I have to try this, my husband will love me to pieces if I make this. I will definitely be passing this recipe along to my hubby, with the manliest of manly videos. Not only does Gordon manage to use one word instructions, and profanities, he does it in less than 3 minutes.